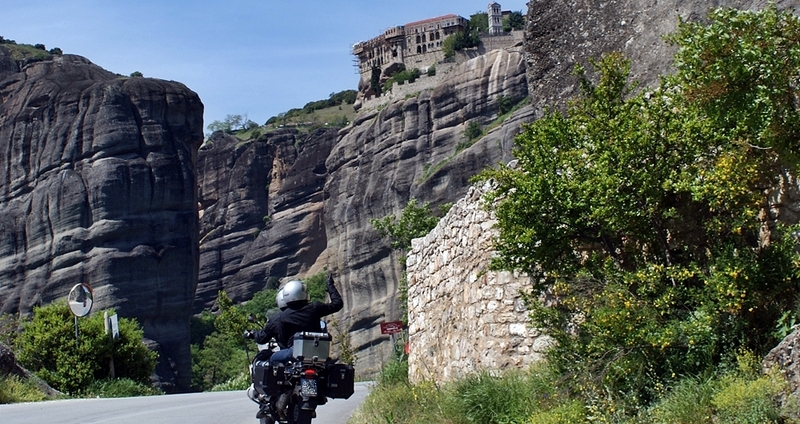 With Zeus motorcycle tour you will come close to the hidden Greek nature, history and culture! With easy routes that pass through dense forests, next to hidden lakes and rivers, small stone built villages and bridges but also from superb beaches and incredibly beautiful National Parks and Wetlands we promise you that you will ride in some of the best routes in Greece, in a great tour that will reveal to you the beauty of mainland Greece. Day 1 - We will meet you at Thessaloniki airport and take you to the hotel, which is located in the centre of the city. Depending on your arrival time you might have time for a city walk, coffee or lunch. We will also might do all motorcycle paperwork, to be ready for riding next morning! In the evening you will meet the rest of the group for the welcome dinner, where we will have a quick briefing of our tour schedule. Day 2 - We will start the day riding East, and very soon we will leave the main road and turn towards Poligiros. The nice country road will take us to the foothills of Mt Holomondas, and we will soon start climbing the twisty road under the shade of the oak trees. We will make a short stop under the huge plain tree at the small picturesque square of Arnea to catch our breath, before we continue riding some excellent, curvy roads to Stagira. Aristotle, the great philosopher was born in this area, and after a short visit in the open-air museum featuring some of his inventions, we will ride through a pine tree forest down to the beaches of Ierissos. A nice, coastal route will take us to Ouranoupolis, our destination for the day, also know as gate to the Holy Mountain ( Agion Oros). 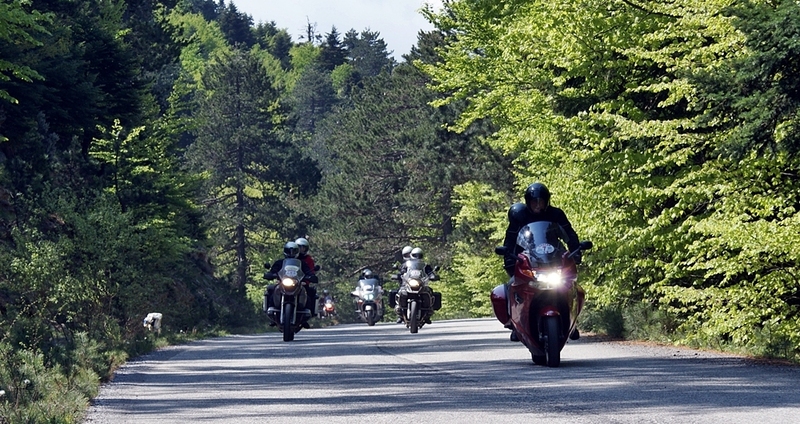 Day 3 - Sithonia is probably the most beautiful peninsula of Halkidiki and also a great route for motorcycles! From Ouronoupolis we will ride to Pirgadikia, a small picturesque fisherman’s village, and then to the beautiful beaches of Vourvourou, on the East coast of Sithonia. Riding the curvy road further south, we will pass some great spots with panoramic views of the beaches and Mt Athos on the back. We can stop for a swim, and around noon we will visit the port of Porto Koufo. Here we will have lunch, as the place is well known for fresh seafood… We will then ride north, on the west side of the peninsula, and after passing by some amazing white sand beaches asd scenic tiny bays, we will arrive at N Marmaras, a busy summer destination. There are some more great beaches north of N. Marmaras, and many opportunities for great photos, before we head back to Ouranoupolis. Day 5 - The program for this day is rather...flexible: You can follow our guide to a ride around the lake and the nearby villages, you can ride the area on your own, or you can just stay in the village. The hotel offers many activities, form boating and bird watching to canoe tours, mountain bikes and extreme 4x4 vehicle tours . It also offers relaxing lounges and a nice flowered garden. Day 6 - Our destination for today is the city of wine and the Macedonian kings - Naousa. We will ride only on country roads, and we will visit Goumenissa , a lovely small town surrounded by hills full of vineyards that produce excellent wine. Goumenissa is also famous for the brass bands. Few kilometers away from Goumenissa we will meet one of the ancient capitals of the Macedonians: Pella. The archaeological site is not that impressive, but the tilled mosaics really are! The area of Naoussa is known amongst others for wine, Macedonian tombs and peaches. To get to Naoussa we will ride through peach trees and vineyards and we will pass by a few Macedonian tombs, some of them open for a visit and photos! Day 7 - After the breakfast at the hotels’ veranda, we will ride to Edessa, for a short stop to admire the old quarter (Varosi) and the waterfalls. We will continue riding through cherry trees and we will soon arrive at the area of Amynteo. A twisting climb on a steep hill slope will take us to the hidden gem of Nymfeo, probably the best preserved and restored traditional settlement of Greece. We will have time to walk the stone paved alleys and enjoy a local lunch, while if you don’t mind, you can walk up to the wild bear refuge of “Arcturos”. A shortcut in a small forest road will take us to Florina in notime, and then another great route is ahead of us: We will climb the perfect biking road to the Ski Center of Pisoderi, and then we will ride down to a beautiful valley that will take us to the area of Prespa lakes. 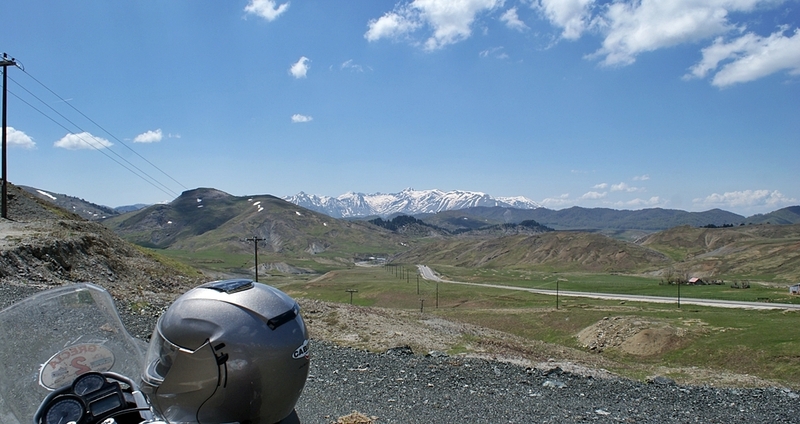 A short stop as we enter the Prespa lakes basin, will provide a panoramic view of the area and some great photos, and a few minutes later we will arrive at Agios Germanos, a traditional settlement and our lovely guesthouse. Day 8 - A short ride will take us to the bridge that connects the small island of Agios Achillios with the shore. There are many legends about this place, but the truth is that there are some very interesting monuments on the island, like the remains of the huge Basilica… Riding in the valley of a small river we will soon arrive at Kastoria. The city is build on a hill next to the lake, and it is famous for the 40+ Byzantine churches, the old mansions and fur production. After Kastoria, we will relax a bit, following a large, easy road for a while. This will take us to Neapoli, where another great route starts: The road to Pentalofos is almost traffic free, full of curves and some demanding turns and of course great scenery! Pentalofos is the home of the most capable stone builders and the churches of the village are the best proof! Lunch in one of the villages taverns is a must…The next 20km from Pentalofos to Eptahori is another surprise, and in our opinion one of the best biking routes in Greece… From Eptahori to Konitsa, you will enjoy riding through valleys and next to rivers, with impressive views to the high mountains that surround the area. From Konitsa we will takea shortcut that will take us to the area of Zagori, that is “behind the mountains”..
Day 9 - The area of Zagori will surely steal you heart...The combination of nature, architecture and people is unique. Our guide will take you to some great places, but you can explore the area on your own if you like… Some of the attraction in the area include Vickos Gorge, the villages of Mikro and Megalo Papigo and Tsepelovo, and the stone bridge “Kalogeriko”, but the area is full of beautiful bridges and villages… There are many great biking routes in the area, so you only have to enjoy them! Day 10 - You will have the opportunity to enjoy Zagori area a little more this morning, as we will ride through the forests and villages of East Zagori. A “secret” forest road will take us close to the small mountainous city of Metsovo, famous for it’s diary products and strong devotion to traditions.. After lunch and resting a bit, we will ride to the other side of the deep valley, and then follow a narrow, twisting road the drops down to the bottom of the valley and then climbs to 1700m, before we ride down to Haliki. 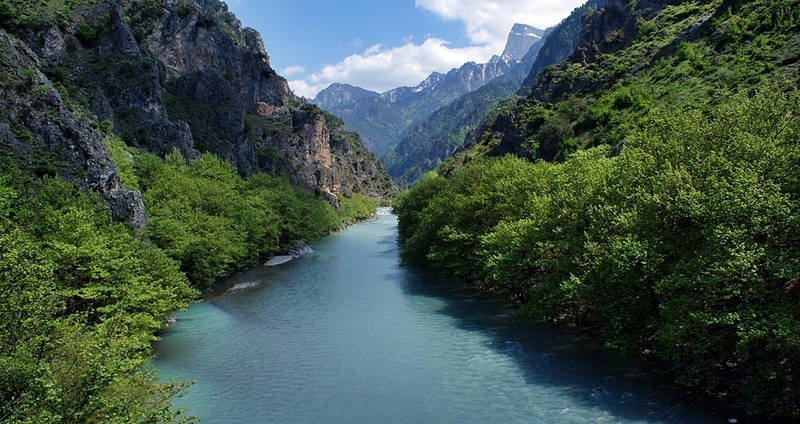 From Haliki, we enter Aspropotamos (white river) area, with the thick forests, high mountains, deep valleys and white water rivers - one of the most unpolluted area of Europe! A few more turns and heirpins and we will soon arrive at the traditionally stone build hotel that will accommodate us for the night. Day 11 - After a big breakfast with fresh local products, we will head north, to the miraculous Meteora monasteries. The one hour ride to Kalambaka is another great biking route, on a freshly paved twisty road. Meteora is a UNESCO world heritage site, with the monasteries build on the top of vertical cliffs, since 12th century! There are 6 monasteries that are open to the public, and most of them are more a museum than a monastery, with items of immense historical value. In any case, even if you are not interested on religion, you will be amazed from the architecture the way and the location this monasteries are build. 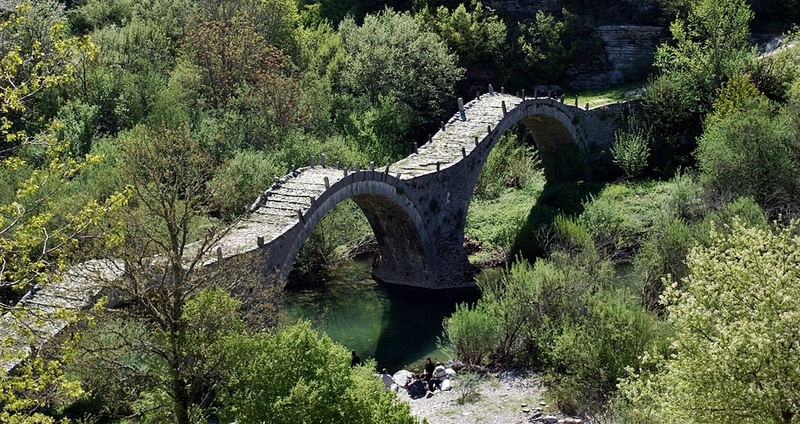 After Meteora, we will head to Volos, from some easy, mostly straight county roads, through fields and small villages. If time is enough we might make a detour to visit Plastiras lake, just few kilometers form Karditsa. The last part for today, the road from Volos to Portaria is a challenging meander, with tight turns and hairpins, sometimes used for car racing... We will stay for 2 nights at Portaria, a lovely village, with great view to the bay and city of Volos. Day 12 - Our last rest day…. 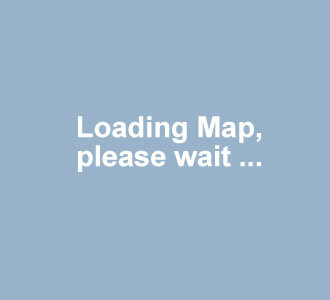 You can stay an enjoy the services of the hotel, but we strongly suggest that you follow your guide around Mt. Pelion. 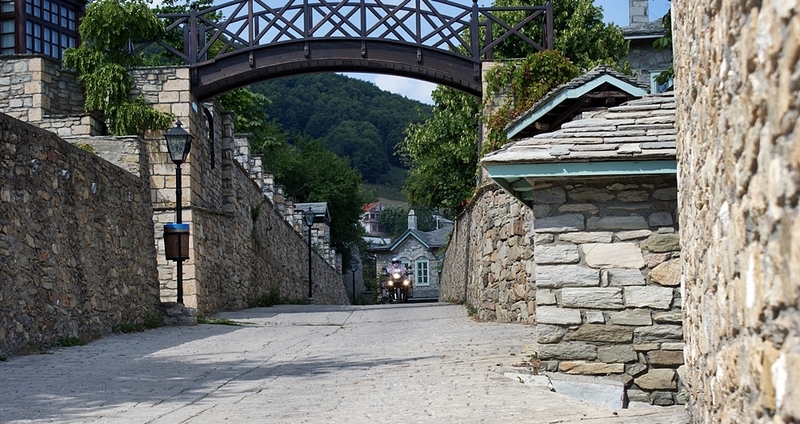 For bikers, the area is a paradise: It is full of small twisting roads that run through dense forest, apple tree fields and small villages with flowered gardens up on the mountain or by the sea! There are both places with lots of visitors and some hidden gems to discover, or you can just enjoy a swim if the weather in fine. Just do not forget to buy the famous home made suites made from fresh fruit... We will return to our hotel in Portaria early in the afternoon, but you are free to explore the area on your own - just ask our guide for tips and instructions! Day 13 - We are getting back to Thessaloniki today, and we will do so riding mostly on small country roads by the sea and around mythic Mt. Olympus, home of the 12 ancient Greek gods. We will arrive at Thessaloniki early in the afternoon, to have time for motorcycle paperwork and the city, before our goodbye dinner. Day 14 - Depending on the time of your flight departure, you can enjoy your breakfast and a tour in Thessaloniki, or just a coffee in one of the numerous coffee places in the beautiful promenade!